Limited time only. Act today to save. 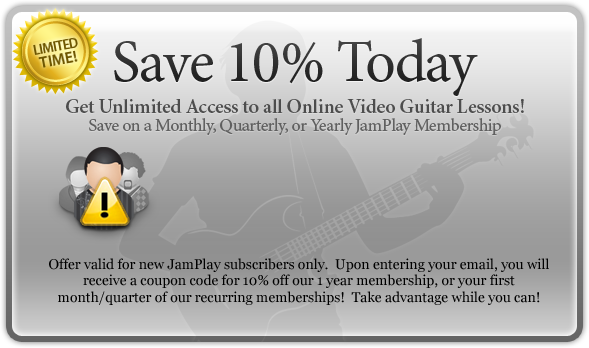 Congratulations on becoming a JamPlay Member. You are well on your way to becoming an expert bass player! Feel confident in using our secure, 256-bit, SSL secure checkout system for your online payments. Review and decide on your preferred membership. Each membership offers you unlimited access to every lesson we offer! Unlimited access for $19.95 per month. Unlimited access for $49.95 per 3 months. Unlimited access for $109.95 for a full year. Only $0.30 / day. Save $129.45 (55% off). Please complete the fields below to setup your membership. Please select your payment method to complete checkout. PayPal payments are gladly accepted at JamPlay, LLC. Once you complete the fields above, click "Complete Signup" below. You will be then be forwarded to PayPal.com to complete your checkout.